Evaluating the performance of one's direct reports and guiding them to do better are critical responsibilities for every manager. Performance Management is not an annual event, nor is it a project or an initiative. It’s the daily or weekly process that is ongoing and fundamental to the success of any employee and any organisation. Most business's are seeking an effective way to integrate competencies into the performance management process. Nowadays, as well, they want to deliver the performance management process through web-enabled technologies. Using Lominger tool-kits, Acumen provides access to the Performance Management Architect® to guide you through implementing research-based processes designed to improve what people accomplish and how they get the job done. From Planning and Goal Setting, to Coaching and Feedback, and ultimately to Performance Review and Appraisal – it’s all here. Performance Management Architect® enables managers to effectively evaluate performance and performance goals. Use with a group to align performance measurements and goals with strategic initiatives, or with an individual you are evaluating to spark discussion about performance goals and results. The Behaviourally Anchored Rating Scales (BARS) that correspond to each Performance Dimension provide a compelling language for effective evaluation of performance – going beyond “good” or “meets” to give a clear picture of differentiated performance among employees. Included here are applications for Job Improvement Strategies, a structured Personal Improvement Plan, best practises for Planning and Goal Setting, Feedback and Coaching, and Performance Reviews. Also provided are how-to’s for the Behaviourally Anchored Rating Scales (BARS) corresponding to each Dimension. 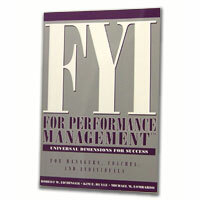 Included in the book’s back jacket is the FYI for Performance Management™ Companion CD which is an added reference and training tool for incorporating the 10 Universal Performance Dimensions into a performance management system. The identification of competencies for key roles will lay the critical foundations for effective organisation planning, recruitment and selection, succession planning, career development and performance management. Interested in becoming certified in Korn Ferry Performance Architect ?